The European Parliament has adopted new rules aimed at reducing the pollution stemming from irrepressible use of plastic bags. Shoppers will be obliged to use re-usable bags, less hazardous for the environment, or pay extra at the counter. Once the rules are confirmed later this year, the 28 member states will be required to reduce the use of plastic bags by some 80 percent by 2025. The states will have a choice of which route to take to achieve the set target. The first choice is for shoppers to reduce the use of “non-biodegradable plastic bags to 90 lightweight bags per citizen by the end of 2019 and 40 by the end of 2025,” the EU Parliament press release reads. The second choice is to just stop giving out plastic bags over the counter completely by the end of 2018. “This is a huge step forward in tackling the plastic waste in Europe's oceans that kills thousands of marine animals each year,” said Liberal Democrat MEP Catherine Bearder. 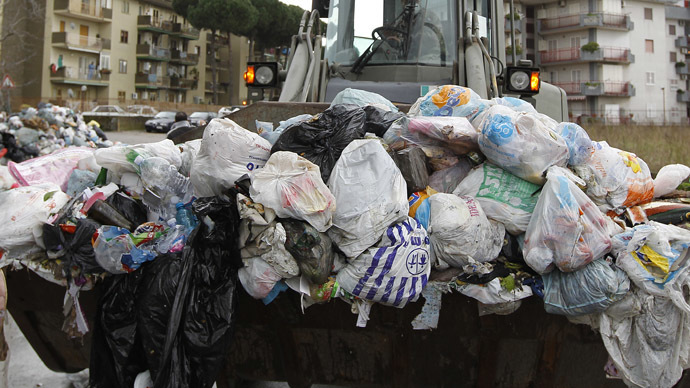 The new rules would also make the European Commission responsible for assessing the environmental impact of “oxo-degradable plastic materials.” The Commission will later use the data to propose proper labeling and marking measures for biodegradable and compostable plastic bags. The EU Parliament argues that most store is in the EU use lightweight plastic bags that are thinner than 50 microns. Because of their thinness they are less likely to get reused in the future, and get thrown away, thus polluting the environment. According to official estimates, five years ago each European national used 198 plastic carrier bags, 90 percent of which was thinner than 50 microns. Of the 100 billion bags consumed in the EU, an estimated eight billion plastic bags were discarded as litter in 2010. In Denmark and Finland only four bags are used per person per year while in places like Slovakia and Portugal that number is 100 times higher. It takes five seconds to manufacture the bag, five years to use it, but an astonishing 500 years to decompose. The Parliament's TV states that 94 percent of birds in the North Sea have fragments of plastic bags in their stomachs. Other animals and mammals across the EU mistakenly ingest the plastic believing it to be an edible treat. Many die as a result.